As a kid I thought it would be fun to play basketball. I have the aggression and determination to play, but I was lacking one major thing, height. Yep, that is right, I was blessed to be vertically challenged and to embrace the “petite” isle. On the basketball court, I was a good 10 inches shorter than everyone else, and let’s face it, unless the team is desperate, I just didn’t stand a chance. That never stopped me from shooting hoops though. I was one of the star athletes on my church’s girls’ basketball team. I enjoyed a leisurely game of “horse” and “round-robin” with the guys as well from time to time. My older kids have started asking about playing sports and basketball has come up a time or two recently…and from my previously mentioned experience, I am certainly not an all-star basketball athlete. So when they ask about it, we just say that it sounds like fun and ask if they know how to play. Like most kids, they answer with excitement, trying to convince us that they do, in-fact, know how to play. When the VersaHoop arrived and my husband and I set it up they finally had the chance to show us what they knew. 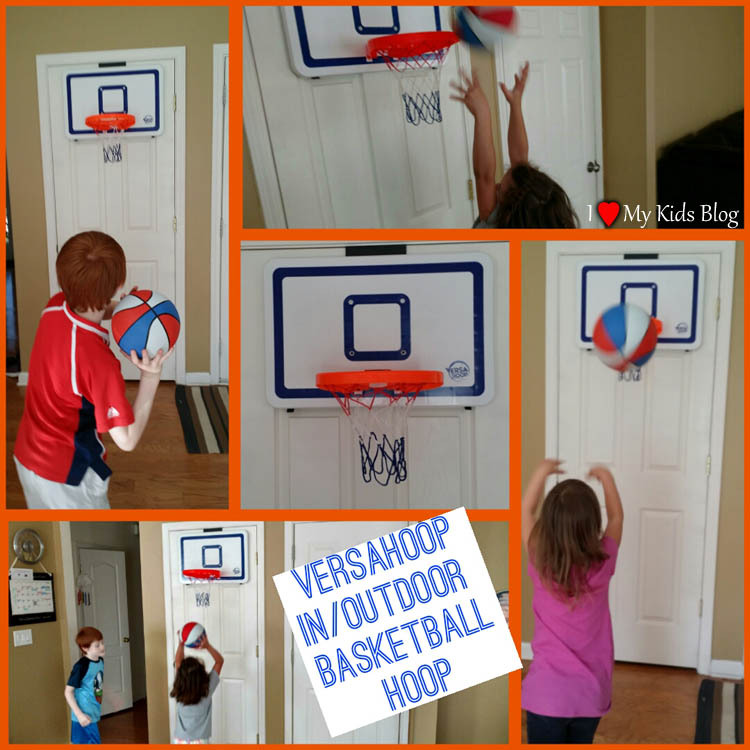 Versahoop provided me with Versahoop Door Hook Hoop kit so I could form an opinion and share it with you. Regardless of this arrangement, I was not required to give a positive review. All opinions expressed are my own honest thoughts. We first set the Versahoop up in our kitchen. Hooking it to the door leading to our storage area, the kids could dribble the basketball and shoot it without the risk of breaking anything of extreme value. The Versahoop has two rubber pads that you can put on the backboard to help prevent any damage to the door that could occur as the ball bounces off repeatedly. It quickly became apparent that my son at least knew that the basketball gets thrown into the hoop, while my oldest daughter had great ball control and dribbling skills. 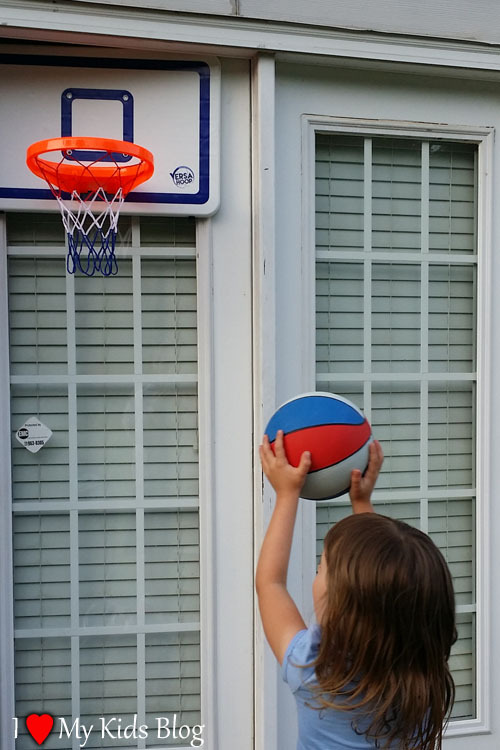 My 4 year old daughter, well, let’s just say she couldn’t have been any cuter trying to figure out how to throw the basketball up in the air high enough to brush the net. As we sat watching the kids enjoy the VersaHoop while playing indoor basketball, I couldn’t help but smile because of the joy they were radiating. Working together to keep score and take turns, the Versahoop allowed my children to work on their teamwork skills, as well as their hand and eye coordination. Day after day they would ask to play and shoot hoops together. When playing in the kitchen got boring, we moved the Versahoop outside on our back door. The Versahoop is so easy to move around and put on virtually any door, anywhere. It will certainly last us a long time, and the quality of the Versahoop is very good. The exciting thing about the Versahoop is that you can purchase it with other attachment options. Instead of the door hook, like we received, you can purchase the Versahoop with a clamp or suction cup attachment. Each attachment option provides endless options for using the Versahoop. I recommend you take some time and visit their website to determine which installment option is best for your family. 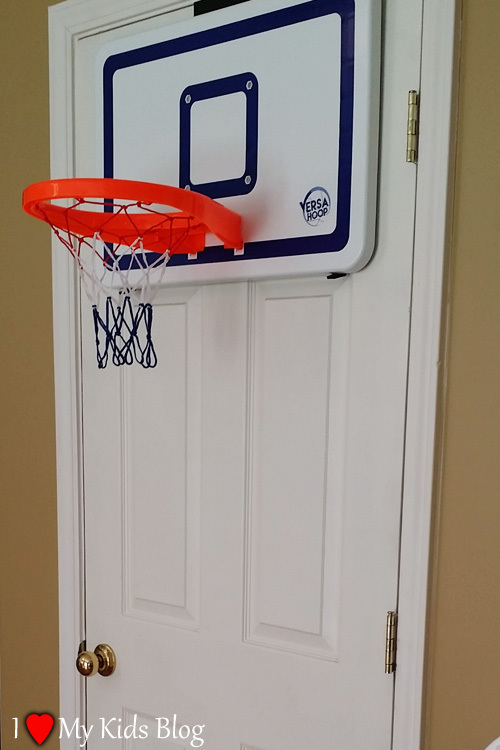 Currently, the Versahoop is attached to my son’s closet door in his bedroom. We aren’t allowing him to have the basketball in his room with the Versahoop, but we are encouraging paper balls and other soft objects to be used as an alternative to the basketball. I look forward to encouraging my kids to continue to play with the Versahoop, especially in the summer. It is helping them understand basketball and giving them a good foundation for practice and shooting. Not to mention it is fun to be able to move it around effortlessly throughout the house and mix things up from time to time. Have your kids shown interest in sports? How did you encourage them to get active and strive to achieve their desires?